Critics of the Bible attack every facet of its credibility. These critics claim that the books were not written at the time they profess to have been written, that the men whose names the books bear are not the actual writers, and that the biblical characters are mental fabrications of the authors. Such criticism, however, is impossible to maintain rationally and honestly in the face of the vast amount of evidence that verifies the validity and authenticity of the 66 books of the Bible. Archaeological findings provide one line of evidence that continues to add credence to the biblical text. Tablets, seals, papyri, pottery, and a host of other ancient artifacts have surfaced that document the lives of characters mentioned in the Bible. These finds often show that the biblical texts under discussion were written at the time they claim to have been written, and that the biblical characters were historic and real. One such archaeological find recently came to light. In 1920, the British Museum acquired a small stone tablet about two inches wide and one inch high. This stone tablet went into a large cache of tablets with ancient cuneiform writing on them. 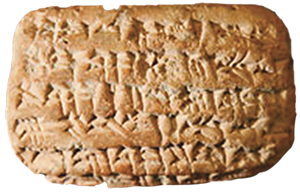 Since few people have the skill and knowledge to translate cuneiform, the tablet sat untranslated in the British Museum for about eight decades. Recently, however, Dr. Michael Jursa of the University of Vienna, one of the few people who can read cuneiform, translated the small stone tablet (Alberge, 2007). The information on the tablet is nothing inherently spectacular. The tablet is dated to 595 B.C. and simply states that a Babylonian official named Nebo-Sarsekim dedicated a large gift of gold to the temple of Esangila in Babylon (Reynolds, 2007). While this inscription is unremarkable by itself, it provides an exciting link to the biblical text. In Jeremiah 39, the prophet described Babylonian King Nebuchadnezzar’s successful attack on the city of Jerusalem. Jeremiah wrote that Nebuchadnezzar penetrated the walls of Jerusalem in the 11th year of King Zedekiah, which corresponds to 587 B.C. Upon infiltrating the walls, Nebuchadnezzar and several of his Babylonian princes sat at the Middle Gate. One of the princes listed as sitting with Nebuchadnezzar was Sarsechim (Jeremiah 39:3). The name “Sarsechim” is recognized as the same name as Nebo-Sarsekim. Thus, the small stone tablet mentions a Babylonian official alive in 595 B.C. and less than 10 years later Jeremiah mentioned an official by the same name. One member of the British Museum’s staff, Dr. Irving Finkel, who works in the Department of the Middle East, said: “A mundane commercial transaction takes its place as a primary witness to one of the turning points in Old Testament history. This is a tablet that deserves to be famous” (as quoted in Alberge, 2007). Skeptics already have begun to attack the find. They suggest that the Nebo-Sarsekim on the tablet could be a different Sarsekim from the one mentioned by Jeremiah. While there is always the possibility that they are not the same person, the circumstantial evidence linking the two names establishes a strong case that the names refer to the same person. They both mention a Babylonian official, during the reign of Nebuchadnezzar, in a time frame that would be expected if the same person is under discussion. In fact, besides a few “ultra-skeptics,” the find seems to be accepted by the majority of scholars as extrabiblical evidence for the existence of the official mentioned in Jeremiah 39:3. Concerning the significance of the find, Dr. Finkel stated: “If Nebo-Sarsekim existed, which other lesser figures in the Old Testament existed? A throwaway detail in the Old Testament turns out to be accurate and true. I think that it means that the whole of the narrative [of Jeremiah] takes on a new kind of power” (as quoted in Reynolds, 2007). The biblical documents have more than archaeological evidence to commend them. Their internal consistency, unity, predictive prophecy, and scientific accuracy combine to produce an irrefutable case for the Bible’s divine inspiration. Archaeological finds such as the tablet inscription, do, however, add cumulative weight to the overall case for the Bible’s factual accuracy. As renowned archaeologist Nelson Glueck observed: “It may be stated categorically that no archaeological discovery has ever controverted a Biblical reference. Scores of archaeological findings have been made which conform in clear outline or exact detail historical statements in the Bible” (1959, p. 31). Alberge, Dalya (2007), “Museum’s Tablet Lends New Weight to Biblical Truth,” The Times, July 11, [On-line], URL: http://www.timesonline.co.uk/tol/comment/faith/article2056362.ece. Reynolds, Nigel (2007), “Tiny Tablet Provides Proof for Old Testament,” Telegraph, July 13, [On-line], URL: http://www.telegraph.co.uk/news/main.jhtml?xml=/news/2007/07/11/ ntablet111.xml.